Alma delivered up the judgment-seat to Nephihah, and confined himself wholly to the high priesthood of the holy order of God, to the testimony of the word, according to the spirit of revelation and prophecy. Shortly after his baptism in 1830, John Murdock remarked, “Being thronged with inquiries, I quit other business and gave my full time to the ministry.” The next year, and only five weeks after his wife had passed away after giving birth to twins, Murdock was called on a mission to Missouri (see Doctrine and Covenants 52:8). He accepted the call and made arrangements for others to take care of his children while he was away. After a year of difficult travels and “plenty of rejection,” Murdock returned to find that one of his infant twins, who were being cared for by Joseph and Emma Smith, had died after an angry mob stormed the Prophet’s home. Such sacrifices were not uncommon among the early Saints. The call to serve did not always come at convenient times or inconvenient circumstances. Nor did it always end happily ever after—at least not in mortality. The sacrifices were just as real as the blessings that would inevitably follow. Undoubtedly, these early missionaries drew great strength and insight from reading about missionary experiences in the Book of Mormon. 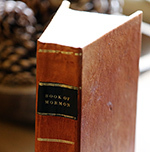 The Book of Mormon showed how to spiritually prepare for a mission (see Alma 17:2–9). It modeled how to serve and what to teach. And it offered stalwart examples of the courageous sacrifices sometimes needed to “go into all the world to preach [the] gospel” (Doctrine and Covenants 18:28). Especially notable are the faithful examples of Alma the Younger and the sons of Mosiah. While serving as the chief judge among the Nephites, Alma saw that the Church was starting to slip into pride and iniquity. In response, he “delivered up the judgment-seat to Nephihah” and, much like John Murdock, “confined himself wholly … to the testimony of the word” (Alma 4:20). The sons of Mosiah also gave up power and privilege in order to preach the gospel. Each of them declined to become the next Nephite king and instead risked their lives to teach among the Lamanites (see Mosiah 28:1–10). After refusing the throne, Ammon willingly became a servant to King Lamoni. This involved tending the king’s flocks, protecting his animals and servants from enemies, and remembering “all [the king’s] commandments to execute them” (Alma 18:10). Aaron and his companions taught among a more hardened group of Lamanites, who “cast them out, and had smitten them, and had driven them from house to house, and from place to place” until they were “bound with strong cords, and kept in prison for many days” (Alma 20:30). In these dire circumstances, they patiently endured “many afflictions … [and] did suffer much, both in body and in mind, such as hunger, thirst and fatigue” (Alma 17:5). Yet the Lord eventually used these unfavorable afflictions to the missionaries’ advantage. Ammon’s humble and consistent service impressed King Lamoni, as well as Lamoni’s father, “who was king over all the land” (Alma 20:8). 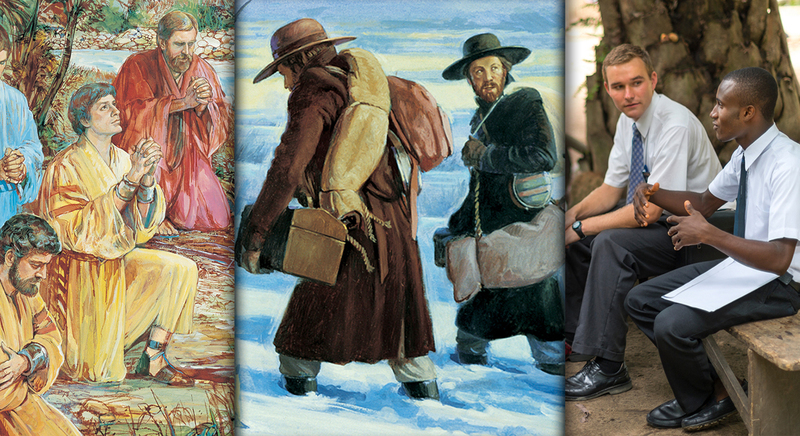 Eventually, Aaron and his missionary companions were freed and allowed to preach among all the Lamanites in the land. Their eventual success, made possible because of their selfless service and patience in afflictions, brought thousands unto Christ and strengthened the church for generations to come (see Alma 23:6). When finally given the opportunity, what did these missionaries first teach their new investigators? Ammon, like his brother Aaron, “began at the creation of the world, and also the creation of Adam, and told him all the things concerning the fall of man” (Alma 18:36; cf. Alma 22:12). He then “expounded unto them the plan of redemption, which was prepared from the foundation of the world; and he also made known unto them concerning the coming of Christ” (Alma 39). In other words, they taught the Plan of Salvation from the beginning and the essential role of Jesus Christ’s Atonement. Just like the missionaries in the Book of Mormon, today’s missionaries must sometimes make real and burdensome sacrifices. Elder Neil L. Andersen has taught, “There will always be something you leave behind when you respond to the prophet’s call to serve.” Whether this means giving up a sports scholarship, postponing education or career opportunities, or leaving behind family members in times of financial or emotional strain, the Lord will always bless those who faithfully serve. Alma and the sons of Mosiah demonstrated their understanding of this principle through complete dedication to their missionary service. After giving up their royal privileges and political influence, they fully devoted their attention to those whom they were serving. So too should missionaries today give up any desires or interests that might interfere with their complete dedication to serve the Lord. Before the sons of Mosiah “taught with power and authority of God,” they first came to truly know and love those whom they served (Alma 17:3). President Henry B. Eyring has explained, “What they think of what we say may depend largely on how much they sense we care for them. … And when they find our concern sincere, the Holy Spirit can more easily touch them to allow us to teach and to testify, as it did for Ammon.” The Book of Mormon powerfully demonstrates that genuine acts of service often precede sincere desires to learn and live the gospel. Like King Lamoni and his father, many people today are not aware of the most fundamental doctrines in God’s eternal plan. For this reason, missionaries often follow the example of Ammon and Aaron by first teaching basic doctrines about the Plan of Salvation and the central role of Jesus Christ’s Atonement. These core doctrines help individuals understand where they came from, why they are here, and where they are going. The gospel message is about more than ancient prophets and abstract principles; it is also about the listener and his or her true spiritual identity and eternal destiny. The Book of Mormon is an essential guide for missionary service in our day. It demonstrates why we should serve, how we should serve, what we should teach, and what we must sometimes give up in order to accomplish the purposes of the Lord. All who follow its inspired patterns of missionary service will, like the sons of Mosiah, find themselves transformed into “instrument[s] in the hands of God to bring … [others] to the knowledge of the truth” (Alma 17:9). Lisa Olsen Tait, “‘I Quit Other Business’: Early Missionaries,” in Revelations in Context: The Stories Behind the Sections of the Doctrine and Covenants (Salt Lake City, UT: The Church of Jesus Christ of Latter-day Saints, 2016), online at history.lds.org. Neil L. Andersen, “Preparing the World for the Second Coming,” Ensign, May 2011, 49–52, online at lds.org. Neal A. Maxwell, “‘Swallowed Up in the Will of the Father’,” Ensign, November 1995, online at lds.org. Tait, “‘I Quit Other Business’,” online at history.lds.org. For information about the first modern mission to the Lamanites, see Richard Dilworth Rust, “A Mission to the Lamanites,” in Revelations in Context, online at history.lds.org. See Book of Mormon Central, “What Did it Mean to be ‘King Over All the Land’? (Alma 20:8),” KnoWhy 128 (June 23, 2016). See Book of Mormon Central, “Why Did Ammon Borrow So Much from Tradition in Alma 26? (Alma 26:8),” KnoWhy 133 (June 30, 2016). L. Tom Perry, “‘The Peaceable Followers of Christ’,” Ensign, November 1989, online at lds.org. Neil L. Andersen, “Preparing the World for the Second Coming,” Ensign, May 2011, 49, online at lds.org. See Neal A. Maxwell, “‘Swallowed Up in the Will of the Father’,” Ensign, November 1995, online at lds.org. Henry B. Eyring, “Witnesses for God,” Ensign, November 1996, online at lds.org. See Dallin H. Oaks, “The Godhead and the Plan of Salvation,” Ensign, May 2017, 101, online at lds.org. See Book of Mormon Central, “What Role Does the Book of Mormon Play in Missionary Work? (2 Nephi 30:3),” KnoWhy 288 (March 17, 2017).